Yes, Yes, I am still here. I have just been busy sewing panel Kozys in whatever spare time I have (where I have energy to do anything ;0) SO much I want to blog about and like NO extra time! There are a million things I want to do and I am almost 38 wks YIKES!! Anyway, I made a bunch of stuff for Christmas (necklaces for the neices, and silk/velvet purses) but I forgot to get pictures. I did get pictures of the soap we made, I'll post those soon. I did manage to take some pictures of some of our Valentines creations (and we made Valentine lighted Jars, but no pictures). I was hoping to post these before V-day but, well a week late will have to do. 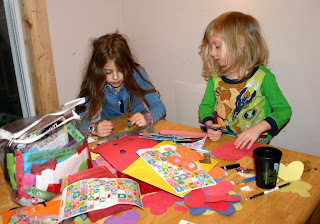 We had a Valentines gathering with our local families for natural living group so we made cards and treats to share. I thank my friend Barbara for these. She gave us some for Christmas. I was like eeeh, pretzels are not my favorite . . . that is until I took a bite!! They have a layer of CARAMEL and then chocolate! They are like a candy bar . . . SOOOOO good!! So of course I had to make some. 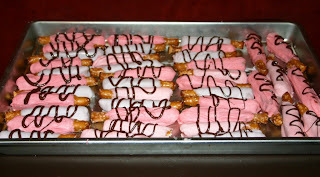 Yes, I used icky food coloring to make them more festive. I'll do another post about how to make them (super easy). 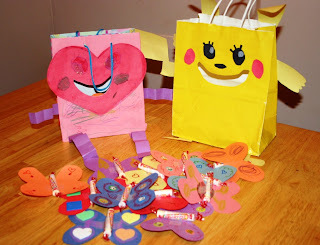 Then the kids got to making Valentines for their friends and Piper and Ever wanted to make bags to hold their Valentines. 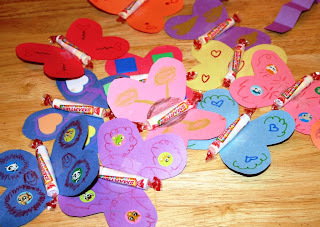 We made butterfly valentines, another idea I got from Family Fun. We made them differently though. I cut out butterfly shapes from construction paper and the kids decorated them with markers, glitter, stickers, etc. Then I taped a roll of smarties in the middle. Fairly easy and quick and they really enjoyed it. Here are some Valentines with the bags that Piper and Ever made (just took gift bags, covered with construction paper and made faces etc.). Pipers is of course Pikachu (pokemon for those of you who don't know, but I am sure most of you do ;0) She did the whole thing herself, and she helped Ever with his heart man. Hope all of y'all had a wonderful Love Day! !